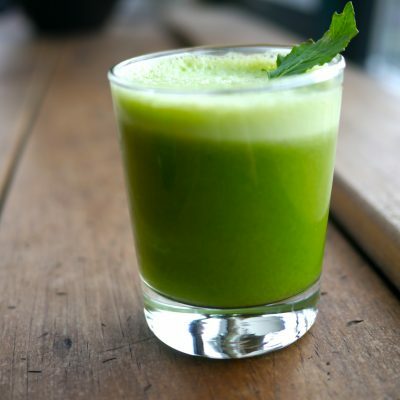 This juice is packed with antioxidants, is delicious and gives a boost of energy, it’s best done in a masticating juicer but if you don’t have one you could always put in the blender and make more of a thick juice. Spirulina is a tiny blue green algae in the shape of a perfect coil. Biologically speaking it is one of the oldest inhabitants of the planet. Appearing 3.6 billion years ago, it provided an evolutionary bridge between bacteria and green plants. Spirulina has nourished many cultures throughout history, it grows naturally in mineral rich alkaline lakes which can be found on every continent often close to volcanoes. It’s called a superfood because its concentration of nutrients is so potent. Many of the essential nutrients needed by our bodies are concentrated in Spirulina. It is comprised of at least 60% all vegetable protein, essential vitamins and phytonutrients such as the rare essential fatty acid GLA, sulphides, glycolipids and polysaccarides. High in B12, Iron and natural beta carotene it’s such a great superfood to add to your smoothies, juices and other delights. We just made some raspberry and spirulina ice lollies! They’re a triumph. Enjoy!